Im an adventurer, who believes in turning ideas into reality. Otherwise known as Mr Attitude. Location, location, location! This property is situated in the centric coyoacan neighborhood one of the most traditional and historic towns in the city in a unique complex of 80 houses with excellent amenities and common areas with 24hrs security. Its a fully equipped house and the best value option to foreign travelers. The drugstores, gas station, public transport, banks and atms, shops, cafes, restaurants, gyms and supermarkets are just a few meters of the house. If you play golf you have next to you one of the best fields in the city. If you like formula 1 and music festivals you are just a 20 minutes from the venue. Plaza Jardin Centenario/Centro Historico Coyoacan just a 5kms. I stayed here while visiting my extended family. The house is close to the areas I wanted to visit. The three bedrooms were very comfortable. We were pleasantly surprised with the roll out bed stored underneath the bunk bed. The bunk bed and roll out were queen size. The neighborhood is very safe. We rented a car and we left it park on the street without any problem. This house really gives you a sense of living in Mexico. All the vintage decorations kept the kids entertained. Rafael is very responsive and will make sure you have a wonderful stay. I didn’t give it five stars because the second bathroom is not big enough to take a shower and the outlets are outdated. Mis amigos y yo disfrutamos de 3 días en esta casa y la pasamos muy ameno. Todas nuestras expectativas fueron superadas. La comodidad de tener un restaurante familiar a una cuadra hizo nuestra estadía más acogedora y sin estrés, el desayuno excelente y por un módico precio. La cercanía al centro antiguo de Coayanan es uno de las cosas buenas de esta propiedad. 15 minutos en Uber. Gracias Rafael por acogernos y recomendar los cirios y restaurantes cerca de la propiedad. Great Home! Great Location! Great Owner! The House: First off, make sure to keep your expectations for size and amenities realistic. My wife and I rented the entire property for two weeks during the holidays (including the independent room upstairs). During this time, we comfortably shared the house with seven of her family members. There were ten people all together, including our son and our youngest sister, who are both pre-school age. Even with such a large group, we found the house to have plenty of living space and sufficient restrooms. Our favorite thing was by far the large dinning room table, where we spent countless hours playing games, eating, and conversing. Also, we found the kitchen to be stocked with all the necessary items for preparing and serving meals. When we were not all sitting around the table, it was nice to kick back on the couch, and take in a little television. The TV is a modern flat screen, and has an Apple TV device hooked up, for access to several media apps. I was able to sign into my Netflix account, and the kiddos never missed out on their favorite shows! However, my personal favorite part, was by far the Rooftop. I spent plenty of quality time, sipping cervezas, enjoying the warm air, and looking out over the city lights. It's also equipped to hang laundry, if you are willing to wash your laundry by hand on the outdoor Lovadora. The Location: This house is located in a very nice, very quiet, and very safe neighborhood. There is a playground for the kids, a recreational area to workout, and even a little store where you can buy the essentials without ever wondering outside the gates. The residents in the neighborhood were all very friendly and welcoming, and the gate guards (who are on duty 24/7) were extremely professional and helpful. Once outside the gates, you are only a short walk away from open air markets, modern grocery stores, countless restaurants, pharmacies, parks, and coffee shops. Beyond that, it is simple to catch a bus over to the Metro, and use it to explore historical sites all over the city. Also, it is worth mentioning that the airport is only about a 30 min trip, in good traffic. The Owner: Rafael was very polite, professional, and helpful. He was on-call 24/7, and was never hard to get in touch with. I think best of all, he respected our privacy. Outside of check-in and check-out, he simply let us enjoy the property, knowing that he was only a phone call away if we needed him for anything! Thanks Rafael! I would recommend this property to my friends and family. The house was very clean, spacious, and overall nice. The rooms were spacious, not cramped and beds were very comfortable. It was in a gated community and the security at the gate monitored every person coming in very well. Exceeded my expectations. We had a super Thanksgiving stay at the house. 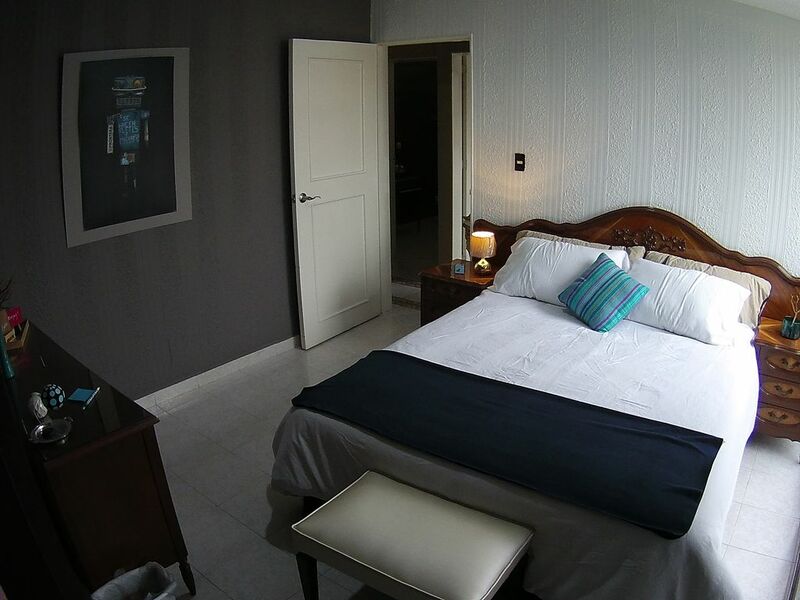 It's comfortable and well-equipped, and the host is very detail oriented, kind, flexible and organized. There are tropical flowers and roses in the front patio, and the gated community was friendly and safe. We were five adults, without the 3rd floor room, and we were comfortable. I think more people would have been too many - depends on your style, of course! Indeed, the downstairs rooms are de facto shared with the 3rd floor tenant, if there is one, since they must pass through the house to enter or exit the room. It was a wonderful time, thank you, Rafael!! I would definitely recommend this house if staying in Mexico City. On arrival we had a very warm welcome and the hospitality continued throughout our stay, Rafael helped with any questions and arranged services such as laundry for us. The area the house was in felt safe, with 24 hour security on the gates. There was 6 of us which was a little tight as we were all sleeping in separate beds. The independent room was unfortunately unavailable during our stay which would of helped with space. One thing to note is that access to this room is through the living space of the main house.